having problem with channel 28. Signal is 50 to 65 in strength. When attaching tv antennas, should they be attached in a "series", not parallel? Thanks for the signal report. Is that WFPA? It is one of your weaker channels. What are you measuring the strength with? What do your good channels measure? Are you using a preamp? The title for your thread says combining, but your question says attaching. What two antennas are you attaching, and why do you want to attach them? There are many ways of attaching antennas. Do you mean attaching them to the mast or do you mean connecting the coax cables together? I see a lot of trees in your area that can block TV signals. Are there trees in the signal path from channel 28? Please tell us more details so that we can give you good advice. trying to combine antennas, using coax, to increase overall gain. Read the above link. Perhaps it will help understand stacking antennas. So combining antennas in series won't work? Combining must always be done in parallel? I know how to connect batteries or resistors in series or parallel, but I don't know what you mean by connecting antennas in series or parallel. I can't answer you question until I know what you mean by connecting antennas in series or parallel. Can you draw a diagram to show us what you mean? 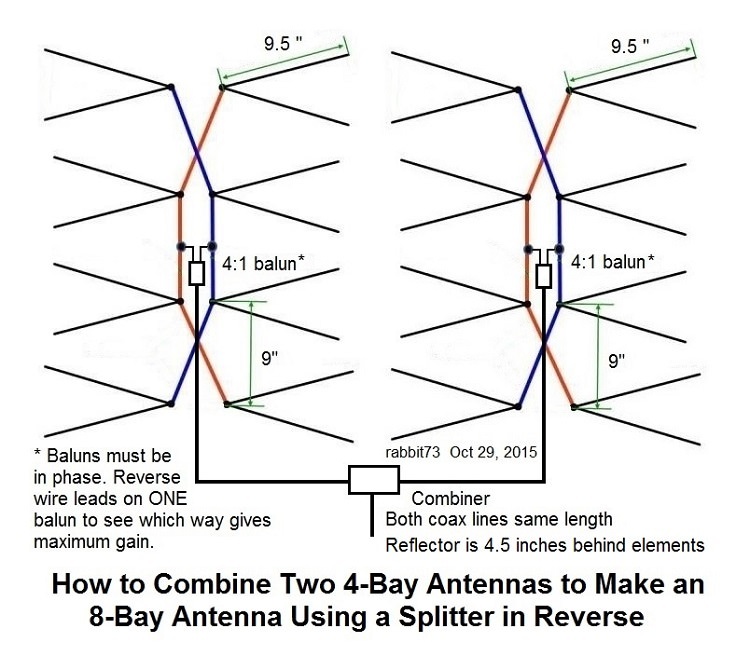 You can combine two IDENTICAL UHF antennas aimed in the SAME direction with a splitter in reverse for more gain; the two coax lines from the antennas to the splitter must be the SAME length. Or you could buy a large high gain antenna like the DB8e. With a built-in sign finder 32dbg.And it's not just uhf? I see the words, but I can't picture it. The above method uses off-the-shelf parts, but there is also a lowest-loss method for an additional 0.5 dB gain, and it requires special DIY connections. Put 2 of the same antennas together!! It you can do it that way too. Will all so help out with your receive. I believe user name for the stacked antennas is HighTower ? Help this person out thank you. Um, user name for this thread is in Wallingford, PA; HighTower on the other forum is in Fresno, CA. I don't think HighTower will actually cut your RG11 coax; he is just giving you a hard time. Ignore him, please. The poster that started this thread is user name. He is having a difficult time describing his reception problem and only gives short answers. I am finding it difficult to understand him, but I am doing the best I can to help him. 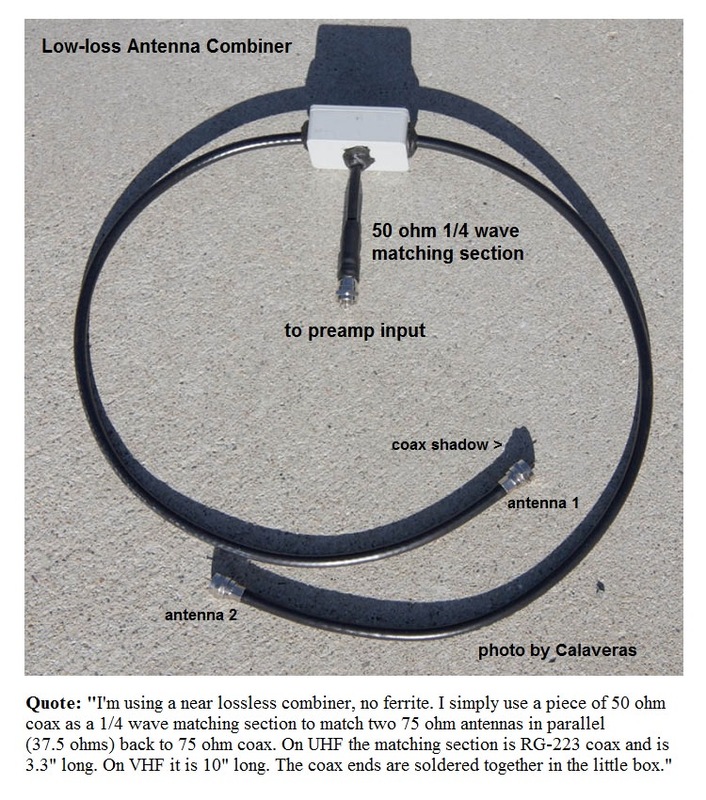 This is a method of connecting two antennas in parallel for more gain. It gives the most gain for two antennas, but it isn't easy to do. 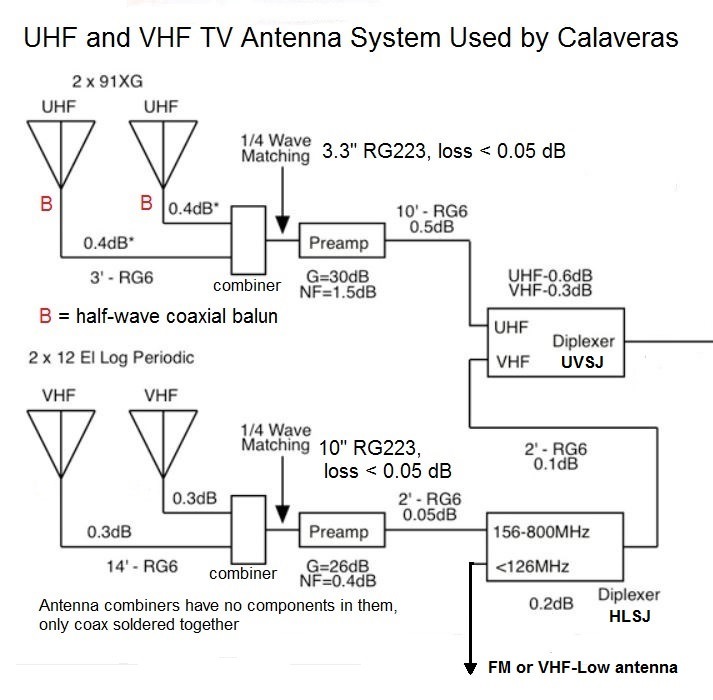 This method is used by Calaveras of AVS for his two 91XGs. This would be one way to connect two antennas in series, but it is not a good idea. rabbit 73 correct me if I am wrong. One could build an open line feed harness between two antennas, or use ladder line. Placing the balun at the center point between the antennas. While I've not yet tried such an array. I plan to to try such an array in the near future. While most TV antenna stacking is done horizontally, stacking vertically will give different results, but in some cases could work better. Yes, it can be done that way. The hard part is determining the impedance of the open-wire lines from each antenna to the combining point so that when they are connected in parallel, you have 300 ohms for the balun. Forum member holl_ands on AVS and digitalhome.ca does modeling; he might be able to help you with that. He has worked out an open-wire harness to combine the two 4-bay antennas of the CM4228HD, which he calls the HHH. While most TV antenna stacking is done horizontally, stacking vertically will give different results, but in some cases could work better. Horizontal stacking reduces the horizontal beamwidth, but maintains the same vertical beamwidth of one antenna. Vertical stacking maintains the same horizontal beamwidth of one antenna, but reduces the vertical beamwidth. You're confusing vertical polarization with vertical stacking of separate antennas. Different animals. Two bay, four bay, and eight bay antennas are all examples of antennas that include a vertical stacking of elements. FWIW, many US stations who did not previously do so will be adding a vertical component to their signal to create either circular or elliptically polarized broadcast signals. In those specific cases, an antenna rotated so that it is vertically polarized will, in fact work just fine. However, since the default polarization of all TV broadcast signals is required by regulation to be horizontally polarized, the default polarization of the receiving antenna should also be horizontal. This is the correct description of the behavior that results from the two commonly executed types of stacking. Yes it's for the brodband? Not sure but not for regular broadcasting?